According to the show description, Mentalist Mason King presents ‘Demonstrations of psychological influence, thought control techniques and direct mind-reading magic’. 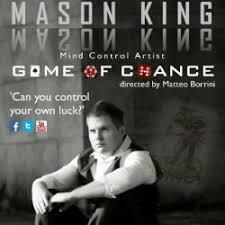 And while most scientists assert that nobody can really read minds… well, if anyone can, that person is Mason King. King captivated the audience with talent, and mesmerized them with his charm. Without giving anything away, let me write that King’s show is a highlight of my Edinburgh Fringe, and I walked away thinking: “That was amazing!” as well as, “HOW did he do that? ?” Which are exactly the emotions one wishes to have after a mentalist show. King’s understated performance put the audience at ease, and made his ‘reveals’ even more astounding. This is an intimate, friendly hour with a master mentalist, and it should not be missed.